Stock car racing is popular in Canada, where several series race in the class. Canadian stock car racing series include: The American Canadian Tour, The Lucas Oil Sportsman Cup,The Ontario Stock Car Association of Asphalt Racers (OSCAAR), The Pro All Stars Series, and, The Canadian Association for Stock Car Auto Racing or CASCAR. CASCAR was founded in 1981 by Anthony Novotny, and would go on to create the first Canadian national stock car series, The CASCAR Super Series in 1986. 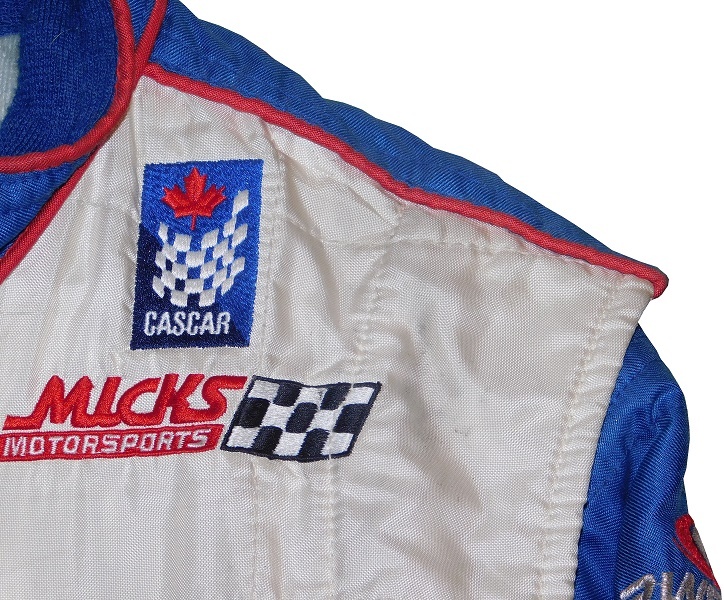 CASCAR had a decent amount of success, but was suffering financially by 2006, when NASCAR purchased them, and created the NASCAR Canadian Tire Series. In 2016, Pinty’s Delicious Foods Inc. became the primary sponsor of the series, and the series is now known as the NASCAR Pinty’s Series. NASCAR will also send an up and coming driver to the Pitny’s Series to help with their development. 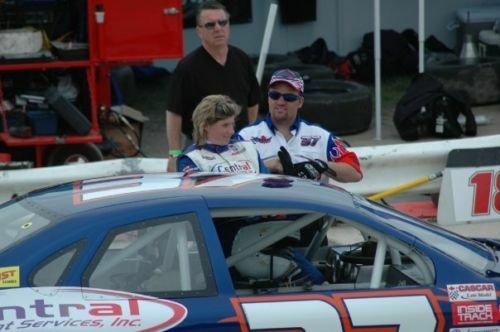 One driver who came into The CASCAR Super Series was Tara MacLeod in 2005. 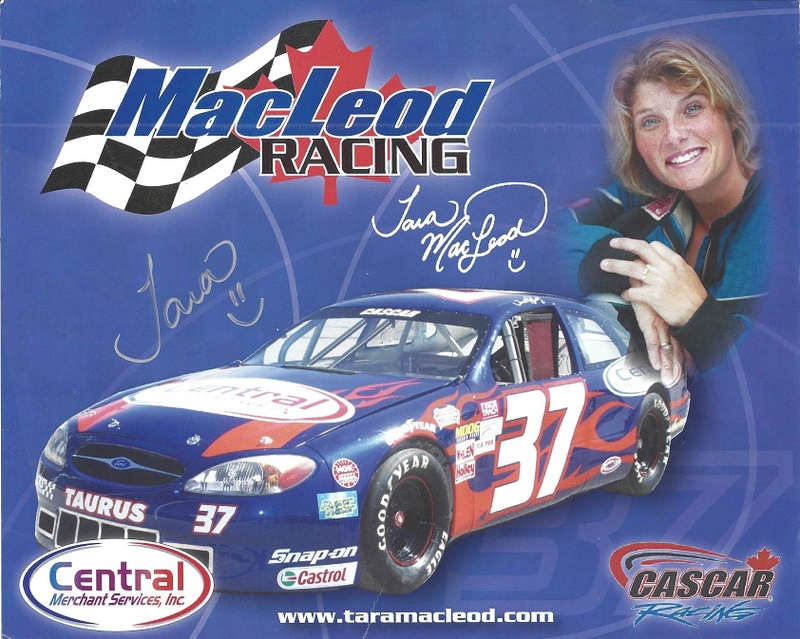 MacLeod had been a driver in the Ontario Late Model scene, and got her chance at the big show with her team MacLeod Racing, who were sponsored by Central Merchant Services. During her rookie season, she raced in 14 events, achieved an 18th place finish, and won Rookie of the Year, but left the series for some reason. 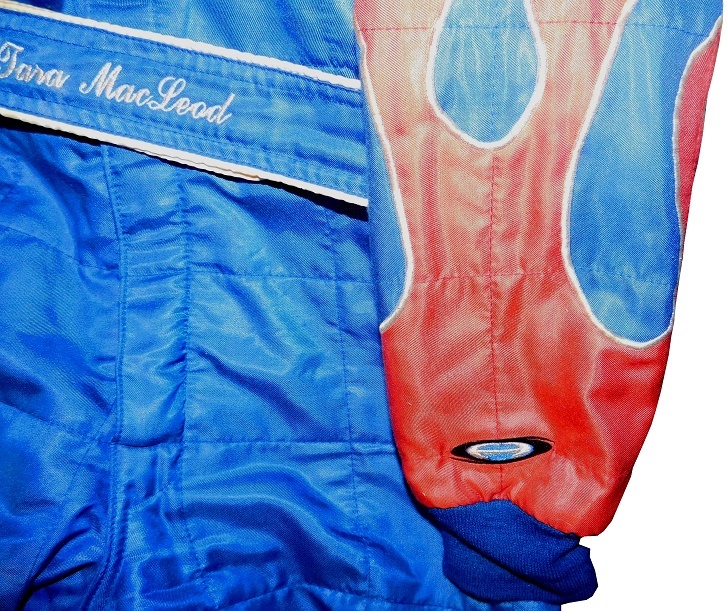 During her rookie year, she wore this Awesome Racewear made driver suit. 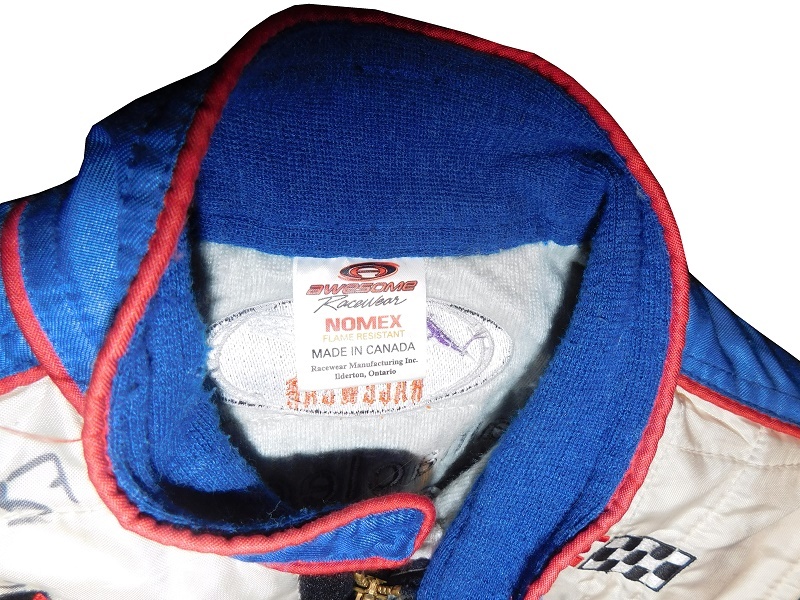 Made by Awesome Racewear in Port Perry, Ontario, the suit shows decent use, with some stains and marks. I also have a hero card, and a couple of photos of MacLeod wearing the suit. 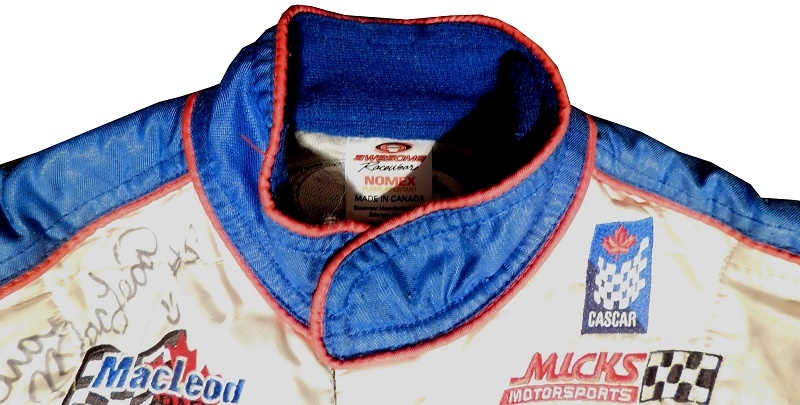 The blue collar is unadorned, and there is a care and size tag in the cowl. Interestingly, there is no warranty label in the suit. 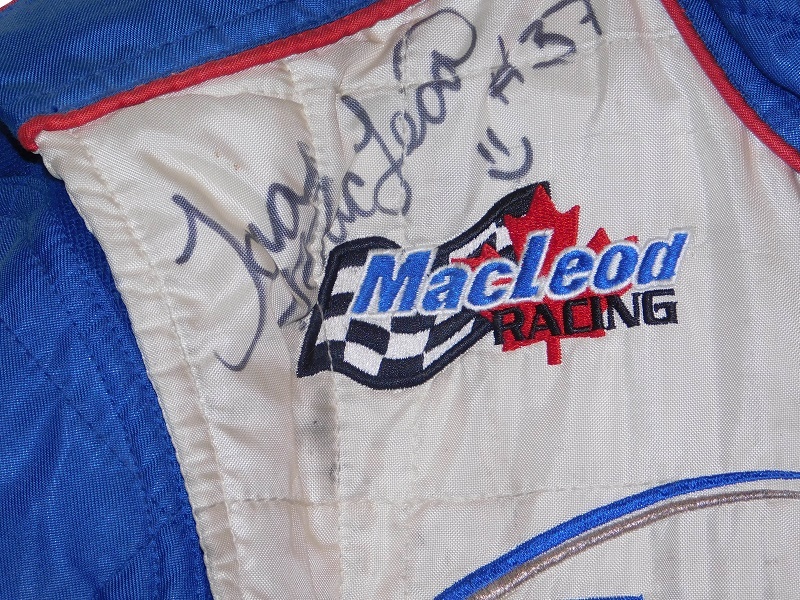 The right chest features a MACLEOD RACING patch embroidered into it. 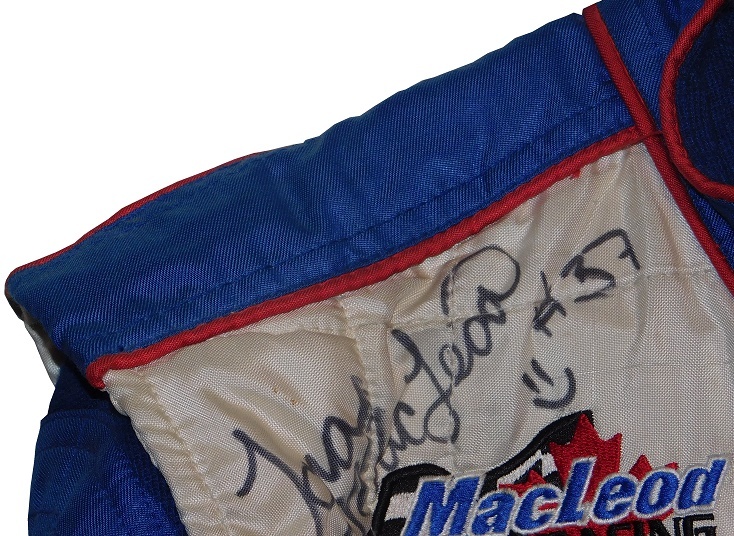 Tara has autographed the area above the logo, and added a smiley face. On a side note, I don’t like when people add smiley faces or other things to autographs. Admittedly, I don’t know why this bugs me as much as it does, but it really annoys me. 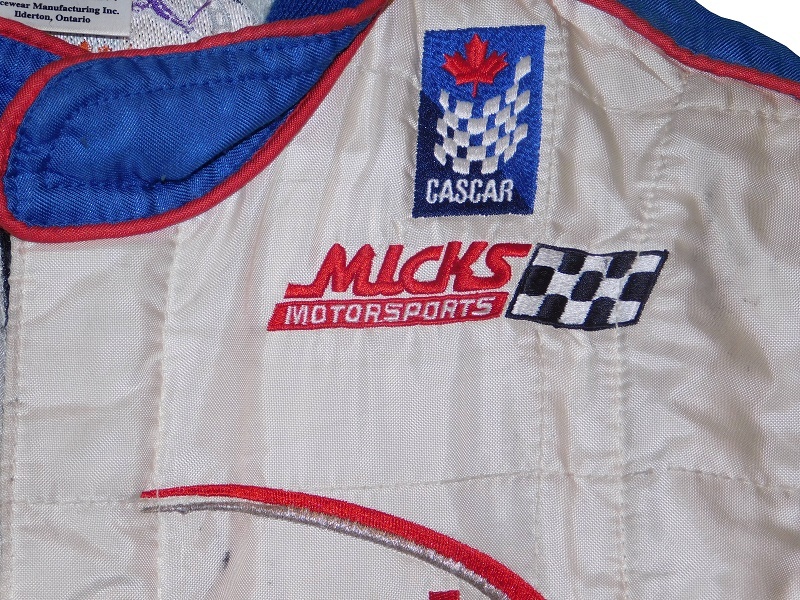 The left chest features a CASCAR logo, and a MICKS MOTORSPORTS logo embroidered into it. 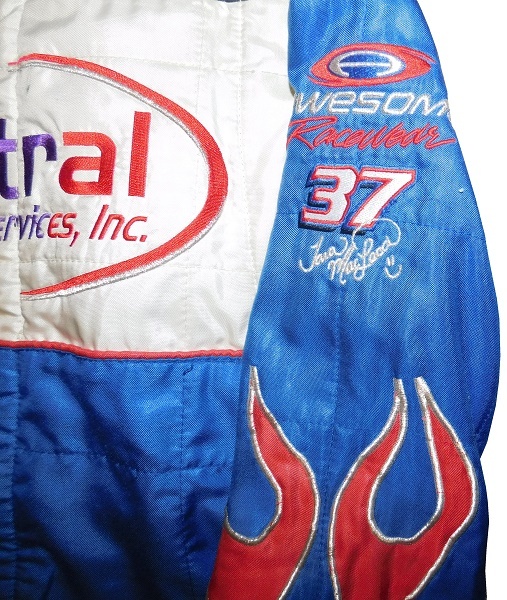 The front torso features a CENTRAL MERCHANT SERVICES logo embroidered into it. A red stripe separates the white and the blue material. 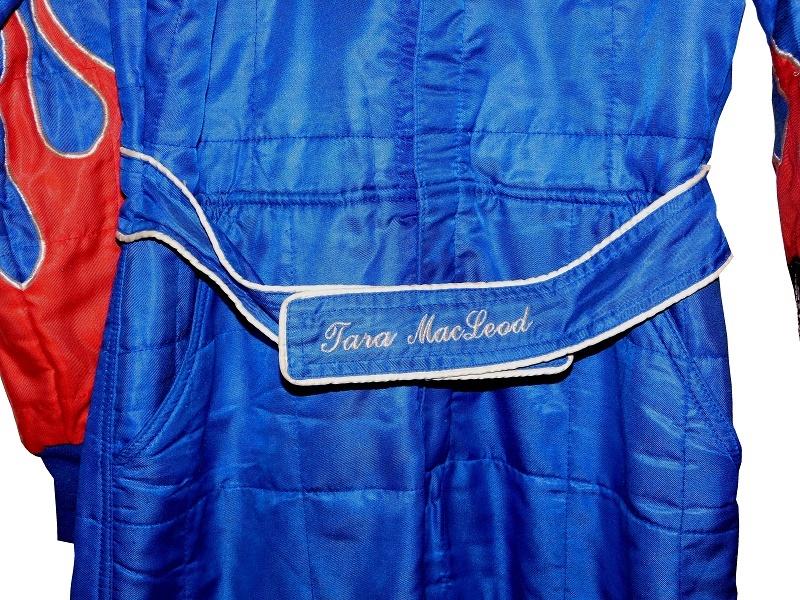 The belt is blue with white borders, and has TARA MACLEOD embroidered into it. The unadorned legs have a quilt pattern, but no logos on the legs. The cuffs are a boot cut. 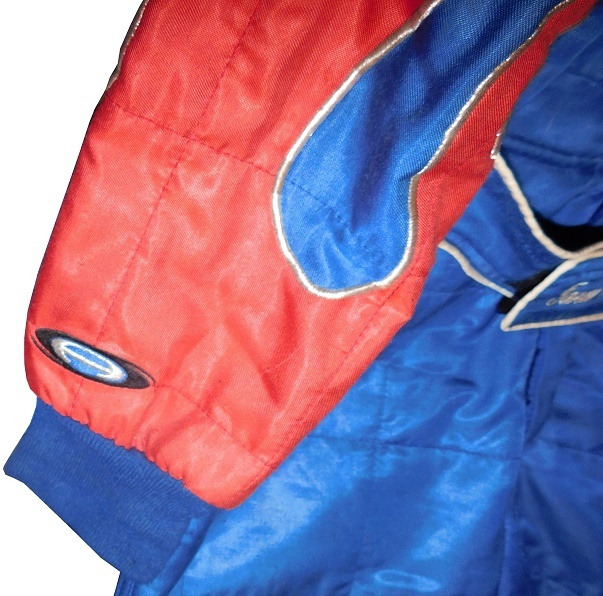 The shoulder epaulets are blue with red borders. They have no adornment on them. 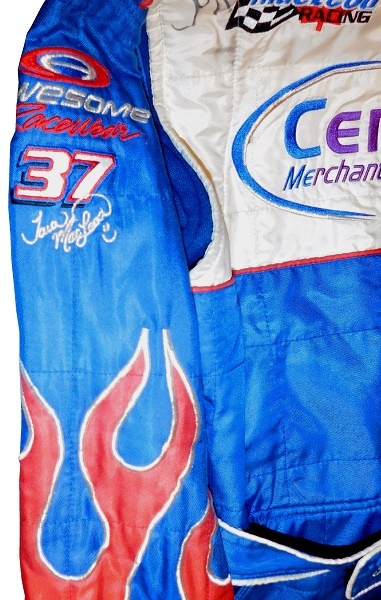 The sleeves have an AWESOME RACEWEAR logo, and a Tara MacLeod #37 logo embroidered into the upper portion, and a red flame design with white borders at the end of the sleeve. The back of the suit shows some light wear. 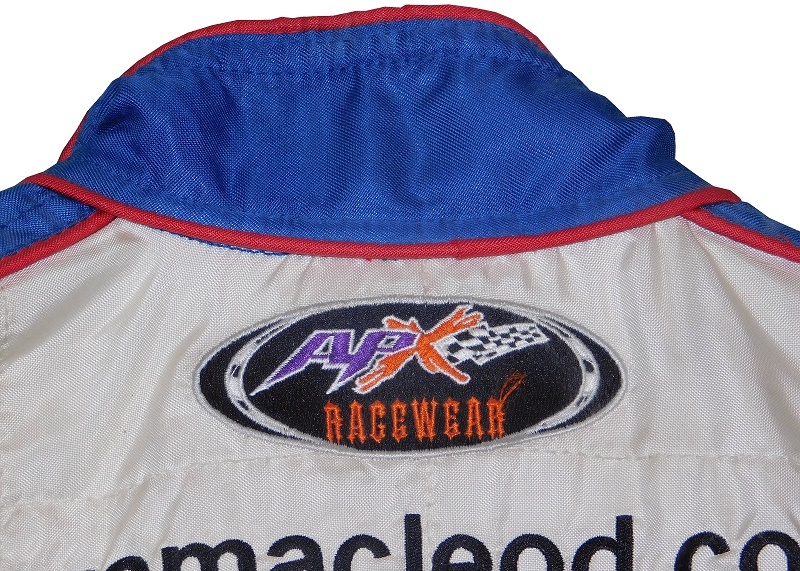 The blue neck is unadorned, but there is an APX RACEWEAR logo embroidered just below it. The back torso features WWW.TARAMACLEOD.COM, Tara’s old website, a CENTRAL MERCHANT SERVICES logo, and the url CENTRALMERCHANT.NET embroidered into it. This was one of the harder suits to research since there are no sites that have CASCAR stats. 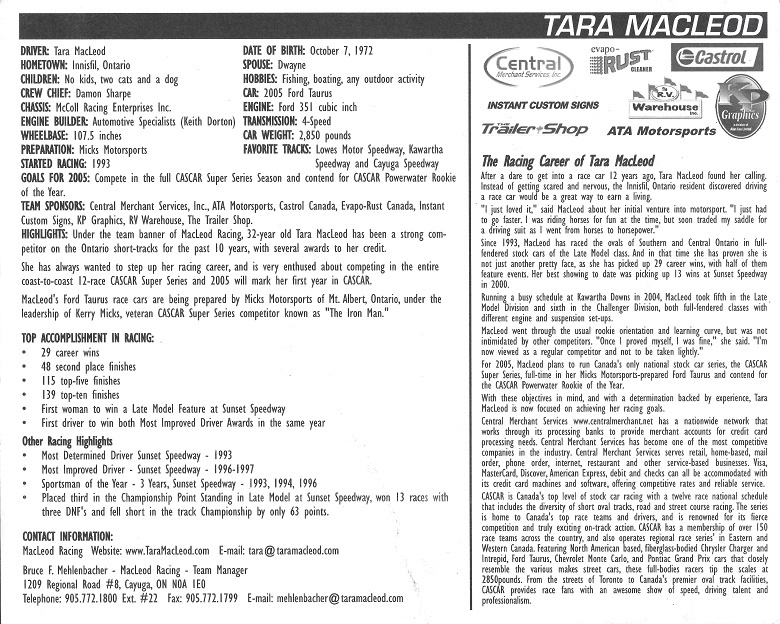 I would have loved to learn more information about it, but sadly Racing Reference has nothing on Tara, and the one site that had some information, Driver DB was sorely lacking. I’m sorry, but I had to work with what little information I had. 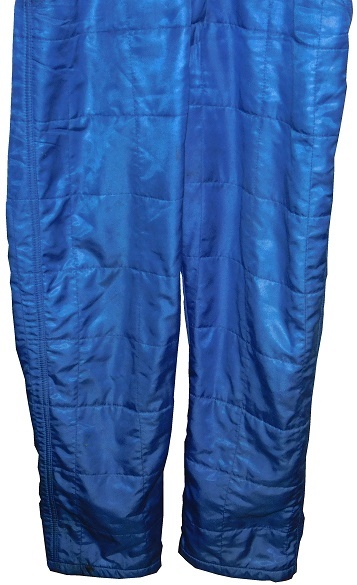 In keeping with firesuits, next week, I’m going to discuss an ARCA pit suit.